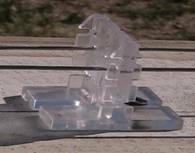 Bird shock systems provide a low voltage shock to the birds when they come in contact with the + - wires, very similar to a dog or cattle shock fence. 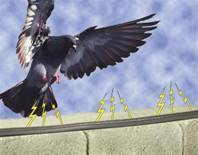 Shock track is usually run on ridge top areas of the roof, along parapet walls or other areas pigeons and larger birds like to land or roost. These products are very effective and comes in a variety of styles and materials that can fit on most any building or structures. pigeon deterrent method on the market today. 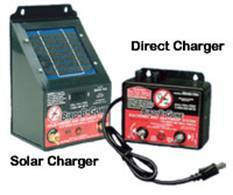 Direct plug-in power supply - Provides power for longer runs of track and a stronger jolt. Solar powered supply - Good for shorter runs and where no plug in power is available. Units are good for about 2 years of use before need to be replaced. Braided stainless steel wires are run in tow rows so that when birds make contact with both the + - wires they receive a small, but effective shock that teaches them to stay away. 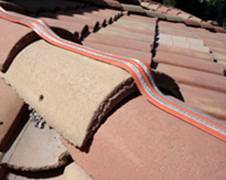 Rubberized track is attached to roof tiles or other building materials with an adhesive to hold it firmly in place. 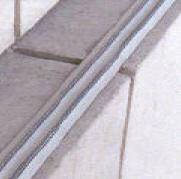 Flex Track shock is mounted using inserts and or screws on tile roofs and other materials. 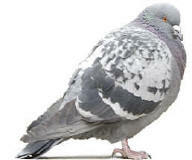 Material is very flexible for a discreet, low profile pigeon deterrent. This is our basic low cost bird shock system where we run post and wire that give the pigeons a shock when they touch both wires. Shock track systems can be used in lots of different places and provide a very low profile and discreet solution to bird problems without hurting the pest bird or pigeon. Below are some examples of different areas shock track is being used. Ledges along building offer pigeons good visibility and a nice place to warm themselves. Tile roof tops can be ruined or the life can be reduced by 20% by the bird droppings on the roof which can also cause water to backup under the tiles and then get into the house, ruining the drywall, carpet and other items inside.